Andrew Blythe is a gifted self-taught artist whose arresting, rhythmic paintings possess a raw and deeply moving beauty. Over the last few years this gifted artist’s practice has been prodigious. Andrew is not inclined to label or title his paintings, but rather for them to be seen as an ongoing dialogue of “free expression and abstract figurative composition, to be enjoyed… I am an empty vessel when I paint.” Much like the abstract expressionists of the mid-20th century, Blythe views the paint brush as a tool to communicate his innermost thoughts and feelings, with each stroke a cathartic expression. The all-over compositions that Blythe creates also align him with painters like Jackson Pollock, with their lack of central focus and proliferation of paint over the picture plane. Using predominantly acrylic paint for its ease of application; Blythe typically paints on paper to enable constant repetition and a pushing and pulling of ideas. His present exhibition at Corban Estate Arts Centre focuses on his monochrome works and the use of pattern to create optically challenging artworks. The repetition of the ‘x’ and the word ‘no’ attribute a rather nihilistic element to the works, however one should approach Blythe’s paintings with an open-mind and attempt to interpret them without the inevitable connotations of such loaded symbols/words. Furthermore, the saturation of the picture planes with these marks almost serves to drain them of their significance and operate on a level independent from traditional interpretation. Since 2000 his passion for painting has been supported by Toi Ora Live Art Trust, a community arts centre providing studio space and tuition for people who have experienced mental illness. Andrew has been exhibiting his works over the last ten years. Andrew is also showing at Darren Knight Gallery in Sydney and has work in a group show at Roar Gallery in Wellington. 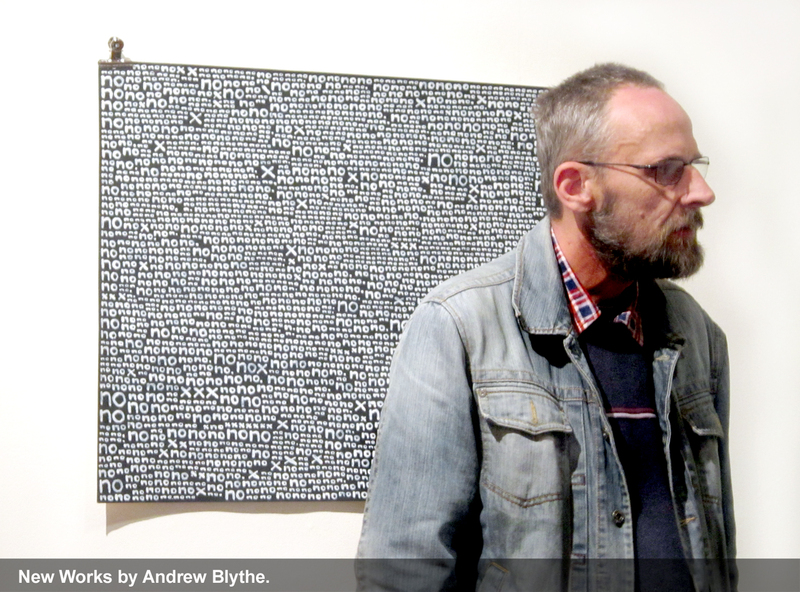 Andrew Blythe's artwork will be on exhibition at CEAC Gallery until 15 April.